I know for me, as I got more comfortable as a UX designer (and more in demand), I began to struggle to manage my time. Having one feature to focus on was one thing, but balancing two or juggling as many as six at one (crazy) time demanded developing a whole new set of time management techniques. Now that I am also a consultant and completely have control of my own time—it’s a time management master class, and let’s just say I’m not always passing. 😉 Here are some techniques that have often helped me. The Pomodoro technique divides time in 25 minute chunks. You pick a specific task, and work on it without paying attention to interruptions for whole “pomodoro” or 25 minute chunk. You set a lovely tomato timer, seen here, to the magic number, and when it goes off you stop. You take a 5 minute break. Do office yoga, get a drink or a snack, or clean your desk for a few minutes. Rest. My favorite part of trying this technique is that it keeps my blood moving and reminds me to get up periodically, although I do have trouble remembering to set the timer in the first place. If it doesn’t get done, move it to tomorrow’s list. I first learned about this technique via Steven Covey’s Seven Habits of Highly Effective People, but 99u recently featured this as the Eisenhower Matrix. The basic idea is this. There are urgent tasks and important tasks. 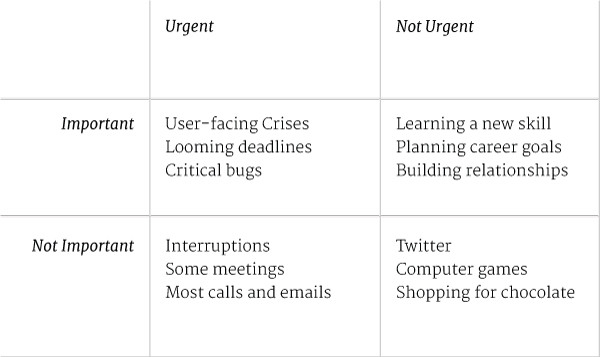 Some are both urgent and important, some are neither. However, the things you need to really grow, improve, and be successful are very important but not urgent. Such as learning about time management (heh), making a personal website when you’re not looking for a job yet, or learning a new in-demand skill. The key action to take based on this is: make time for the important but not urgent tasks. If you don’t set aside time to do them, they won’t happen. Also, ignoring them tends to create more and more urgent tasks, leading to a cycle of “fire-fighting” and endless living in urgent mode. You have to get ahead of it. Work on that company style guide or interface guideline. 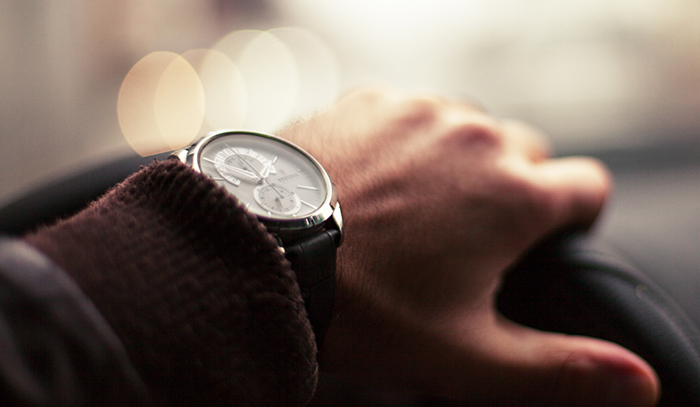 Take time to interview a user with no deadline looming. Talk to a colleague about your company’s long-term goals or your personal career ones. Whatever falls into that quadrant for you, make time for it. You’ll be glad you did.